SIMPSON BAY, St. Maarten (February 15th 2011) - Princess Juliana International Airport (PJIA) has won a prestigious aviation award. At the annual Routes conference that was wrapped up on Tuesday February 15th 2011 in Santo Domingo, Dominican Republic, PJIA came out as overall winner in the category South Central Americas, that included such airports as the The Princess Beatrix of Aruba, the Sangster International in Montego Bay, Jamaica, the Mc Carran in Las Vegas and the Tecumen in Panama. “This is truly a great honor,” then PJIAE Interim Managing Director Mr. Larry Donker said. 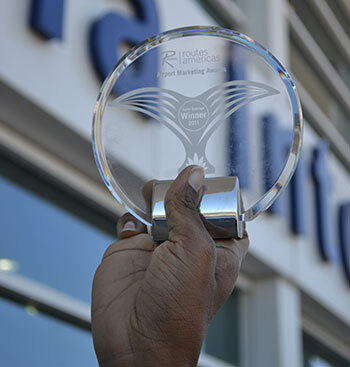 “To be named the best airport in our region by our airline partners is validation for all the hard work all of us at PJIA –from Management to workers and partners- put into making our airport a Regional Leader.” PJIA is now automatically shortlisted for the World Routes Airport Marketing Awards that will be announced in September. Mr. Donker explained that cupping the Regional Award is already a feat to be proud of. “We were notified a few weeks ago that we had been nominated by the airlines for this award and that we had even been shortlisted,” he said. Nominations had been received from airline network planners and others on the Routes database, as well as others involved in commercial and marketing support on a local level. Airlines considered the airport’s marketing efforts, the marketing research and efforts, its joint communication campaigns with third parties, and its innovative use of technologies or techniques to support airlines. “We were required to highlight our efforts in a 1,000 word presentation and our Marketing and Communications Department really did a superb job at that, considering all the activities we have rolled out over the past couple of years,” Mr. Donker said. 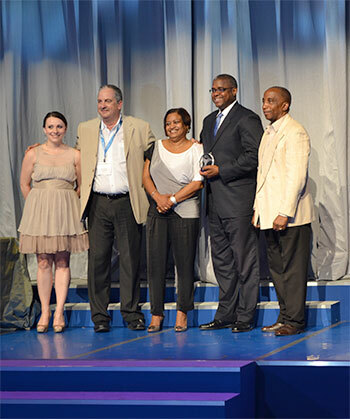 The presentation made mention of the construction of the airport’s terminal building, its attendance and hosting of international aviation conferences, its inventive local marketing strategies and its airlift development and international marketing efforts that are being undertaken in collaboration with the St. Maarten Tourist Bureau. “We have been extremely active and that made us stand out amongst the other airports that had also been nominated,” Mr. Donker said. Mr. Donker expressed congratulations to the community of St. Maarten. “This is not just PJIAE’s victory, but St. Maarten’s,” he said. It was the first time Routes Americas, now in its fourth year, is held in the Caribbean. Organized by Routes and hosted by Aerodom the conference closed off on 15 February 2011 in the Dominican Republic. It is a route development forum for airline, airport and tourist authorities.